Burda 6910 – Part II | Fabric, Thread, Clothes? Posted on March 8, 2014	by Fabric, Thread, Clothes? You know how it is when you make something and it just feels perfect? Right length, right color, right style, etc? That’s how I feel about my purple-y Burda 6910. I’ve worn it twice and it just works. I didn’t feel ready to tackle another work shirt quite yet, so I decided that since the pattern was still laying out, I’d make another one. Today’s is made from some gray jersey that I’ve had in the stash forever. I don’t remember where, when or even what else I’ve made from this. It only has 1 way stretch and the pattern calls for 2, so I cut per pattern, but sewed with a 3/8 inch seam allowance instead of 5/8. It worked perfectly. It’s unhemmed still – that’s tomorrow’s task. I was getting tired and knew that if I tried to finish it up, I’d probably mess something up. On this version, I brought the neckline in a little bit. I had never done that on a raglan top, so I just kind of winged it. 🙂 I am impressed with myself that I felt confident enough to do that. I considered using the neckline from Burda 6990, http://new.patternreview.com/Patterns/61845#.UxvehYXy3ps, but when I laid the pattern over top, it just wasn’t making much sense to me. It looked like 6990 was designed to have more ease, and I decided that was just too hard to figure out. So, I went back to 6910, pinned the front, sleeve and back together, then I put wax paper underneath and just increased the line an inch at the center shoulder, curving out to the center front and center back. Then I unpinned and added in seam allowances where needed. What I didn’t consider though is that at the neckline, there would been to be a little dart to allow for the curve of the shoulder. 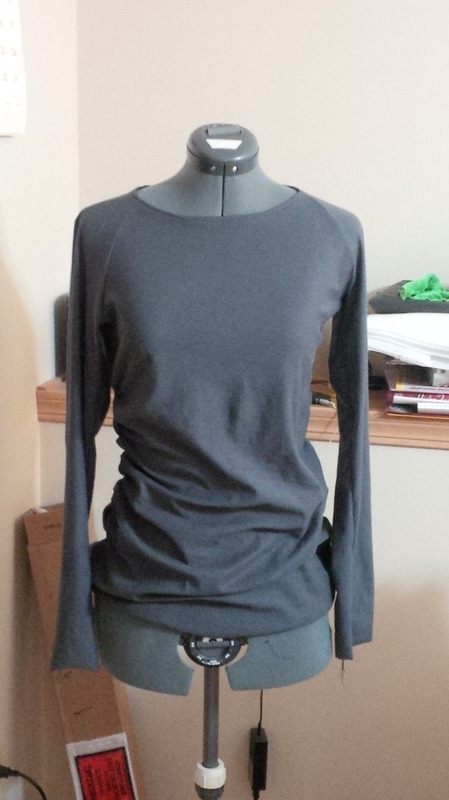 I sewed it all up and tried it on before doing the neckline and I saw the need for the dart then. I just pinched out a little one and sewed it in. It’s not really noticeable when I have the top on. For the neck binding, I used Jalie’s hidden binding technique. That worked well too. It’s described in Jalie 3024 http://new.patternreview.com/patterns/42250#.Uxvg9YXy3ps. (In my opinion, that pattern is worth buying for the binding instructions alone. There’s instructions for a visible binding too). On the first top, I totally screwed up the binding and stretched out the neck, so on this one I stay stitched as soon as I had the front, back and sleeves together, and then proceeded. The Jalie instructions worked. They call for a strip of binding about 1 inch wide. Since I had changed the neckline, I just cut the binidng longer than I thought I’d need, pinned most of it to the shirt per the instructions, and then pinned where the two sides of the binding met and sewed it into a loop before finishing the pinning and stitching. That’s my cheaters method – but I actually think it works better than sewing it into a loop first in most cases. 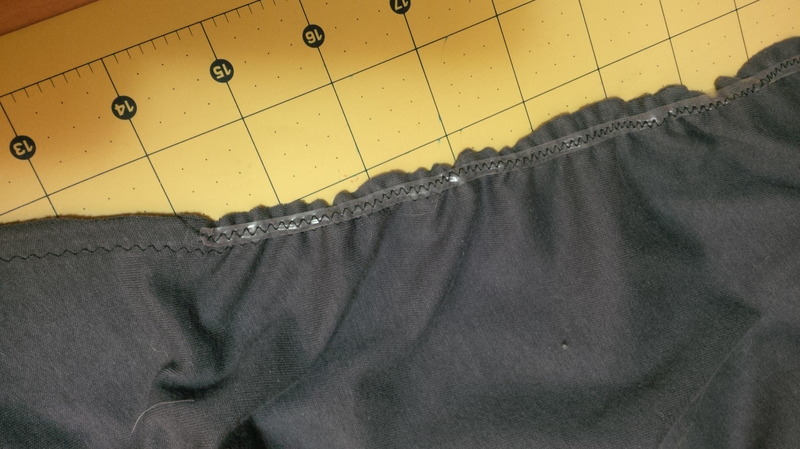 Here’s a pic of how I sewed the elastic in the side seam. I’ll finish the hems tomorrow, and then there might be one more of these in my future. I have some navy fabric that I think would work well with this pattern. I’d like to attempt dipping it in some gray dye to mute the color just a bit though. Just for fun, here’s a pic of me in my 1st 100% Dressing Your Truth outfit! 🙂 I wore it out to dinner last night with my husband and some friends. (Yes, those shoes ARE pink:) Aren’t they fun?? I found them at Ross’s the other night and they were only 16 or 17 dollars and they’re super comfortable. Black will gradually (mostly) be banished from my wardrobe…including black shoes!). You look great – nice colours! I am tired of seeing so much black in clothes. I read an article on wardrobe basics and everything (shoes, pants, dress…) was black! looks great. I’d like to try that neck line binding method. I’ve just made a tee and I think the back neck has stretched out slightly. I’m cutting another one tonight and though about stay stitching so I will give this a go. Hah! I love it when you find the perfect knit top pattern! Also, I am intrigued by the elastic in the side seam there. 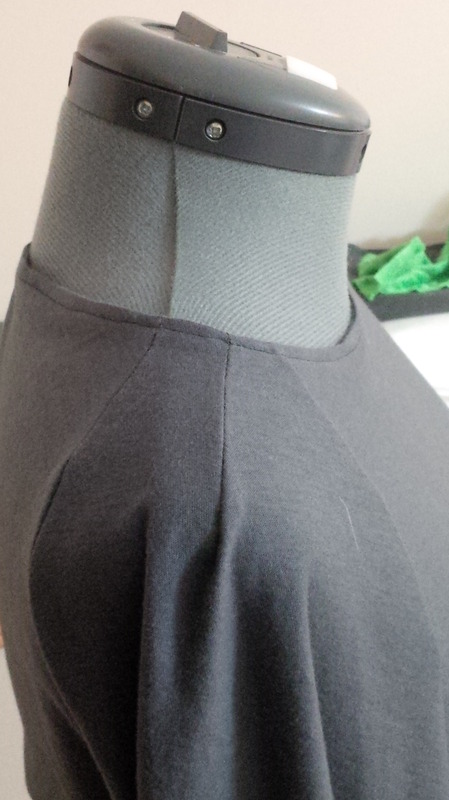 I’ve examined some of my RTW clothes and found the same type of elastic sewn into necklines, to keep them from gaping. I’ve never sewn with it though – I think I will have to order some. Hi Ellen, Hopefully you’ve figured this out by now! Do the side seams on your front and back piece match? I’m not sure where you’re measuring from..if it’s from bottom to top of center back and front, it would make sense to me that they’d be different lengths. The front neckline is going to scoop down more than the back. I think the side seams should match, though. You may want to pull out the pattern and make sure that you cut on the right lines. thanks for the reply…it tells me they SHOULD match up, or at least yours did…and yet mine don’t. I took the pattern to the fabric store and everyone was stumped. We checked everything against the original…4 staff! Couldn’t find the error. I am going to baste the front and “gather” until they match up, then sew the side seams on my pre- cut fabric. Then I am going to try again on another cheap fabric by cutting the actual pattern pieces out…just to see if it is any different…because obviously this pattern isn’t going to be a “favourite”, haha. Thanks Emily.